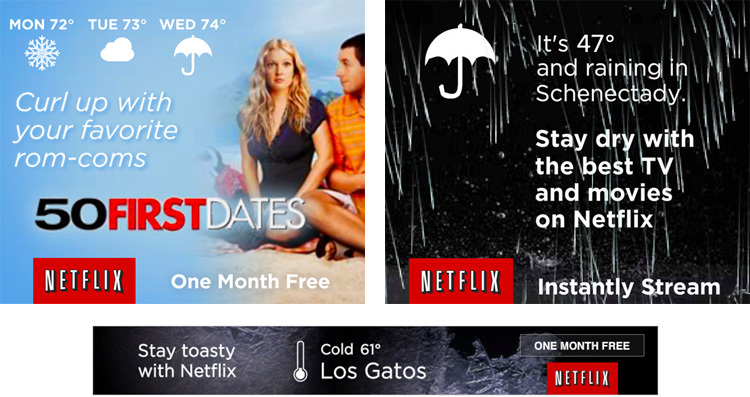 Netflix used the Aeris Weather API for their advertisements amid the 2013 holiday season during a time of increased online traffic. The primary goal of the ad campaign was to display short-term advertisements and viewing suggestions based on weather conditions for the viewer’s particular location. The advertisements were generated dynamically for each request, which required that the Aeris Weather API provide the necessary current and forecast weather data for millions of API requests per day without a substantial increase in response times. The simplicity and flexibility of the Aeris Weather API gave Netflix the ability to use only the weather data they were most interested in while ensuring data transfer to their advertising platform was quick and efficient. HAMweather was also readily available to provide complete usage and integration assistance throughout the development of the campaign. Once the campaign went live, HAMweather remained committed to providing continuous support to ensure the API’s quick response times and that the weather content it delivered continued to fulfill Netflix’s goal of delivering its dynamic advertising campaign. By working directly with HAMweather and the Aeris Weather API, Netflix was able to provide the necessary weather integration into their highly personalized ad campaign. The creative combination of advertising and geolocated weather data provided a seamless way for Netflix to offer content suggestions to their viewers that were highly dynamic and personalized. With the weather constantly changing, this integration also allowed Netflix to offer a wider variety of suggestions within their campaign, ensuring the user is presenting with fresh content across their viewing experience. Netflix continues to drive towards and succeed by their long-term goals of becoming the best global entertainment distribution service, licensing entertainment content around the world, creating markets that are accessible to film makers and helping content creators around the world to find a global audience.